Housemade Cheese, Stracciatella (Php 325) is served with toast, EVOO and arugula. Stracciatella is a kind of soft cheese made from buffalo milk. It is creamy, but the salt, pepper and arugula adds texture while eating it with toast. The toasts we got were a bit burnt though. We also tried Pinoy Eggs (Php 125) and Duck You! (Php 185). Pinoy Eggs are five-minute free range duck eggs wrapped in housemade longanisa over fiddlehead fern salad. Slicing through the egg reveals a runny yolk. Don't ignore the fiddlehead fern salad, it was superb! :) Duck You! is fries cooked in duck fat, topped with duck skin chicharon and duck confit. It is served with cherry vinegar in a spray bottle. My friends had fun spraying the cherry vinegar on the fries. Loved it! One of the best salads I've had in my life is the January Salad (Php 550). Tagged as a cleansing salad, the January Salad has fermented tea leaves, chia seeds, romaine, chickpeas, cherry tomatoes, river shrimps, cucumber, sunflower seeds, sesame seeds, peanuts, garlic chips, bell peppers and lemon. My friends loved it as much I did, but I'm afraid this will only be available this month. Chef Robby, make this permanent on your menu, please? For pasta, we ordered the seasonal Crab Meat and Sea Urchin Pasta (Php 385 for solo, Php 525 to share) and All' Amatriciana (Php 355 for solo, Php 495 to share). The Crab Meat and Sea Urchin Pasta was creamy all over. It was truly impressive, and that's coming from a non-seafood fanatic. The All' Amatriciana was topped with two huge pieces of pancetta on top, the acid from the sauce is just right. We weren't able to try a lot of the popular main dishes as the appetizers, salad and pasta were enough to make us full, but we ordered the Roast Organic Chicken (Php 595). The meat was juicy, tender and flavorful. How can something that looks so simple be that good? I was sooo giddy about trying all the desserts, but my friends were more inclined to transfer resto, so I settled with Milkeggshoney (Php 155). 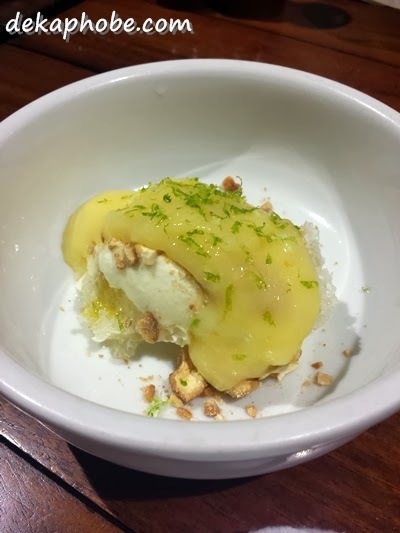 The dessert has organic honeycomb, housemade Greek yogurt and citrus curd. It took me a while to appreciate the acidity, but it was a great palate cleanser after a hearty meal. During the second visit, I skipped the dessert and went for one of the organic coffees: Hineleban from Bukidnon (Php 105). 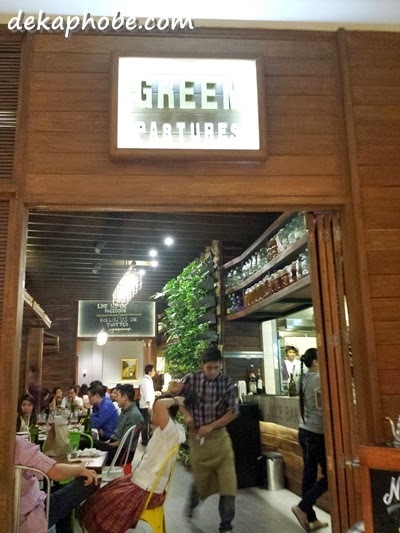 Green Pastures is one of the best food experiences I've had for such a long time. Each dish was of quality and made from organic produce. The prices are quite reasonable for the food and service. And yes, I would gladly wait in line for more of what Chef Robby has to offer. I have yet to try an organic restaurant and this one looks promising, I am sure to check it out. I love the glasses that they use for the tea, like a mason jar with a handle, so cool! This is the first time I've heard of a hineleban coffee, since I am a coffee addict, I HAVE to try it. And also the crab meat and sea urchin pasta. I've always wondered how sea urchin tastes like, maybe it's the closest thing that I could get to it. Everything looks good! Seriously wanna try this soon. Anything organic! Sarap ng stracciatella!! :-) Picture pa lang... grabe. Hope to visit soon!